I have a history of mental illness, namely anxiety and depression. A lot of my friends also have, or have had, mental illness. Seeing as I started particularly early with the whole mental illness thing, my friends have often come to me for advice when they've started to go through it themselves - as they know I've been there too and have learnt a lot from my experiences over the years. When listening to them offload about their respective mental health issues a reoccurring comment often comes up; ‘I feel so weak for having this issue’. Despite this being a common theme it still surprises me every time I hear it, as I've never felt this way myself, despite the many severe incidents of debilitating mental health that I've had. And I've certainly never thought that way about others with mental illnesses either. In fact, I truthfully have always believed the complete opposite. 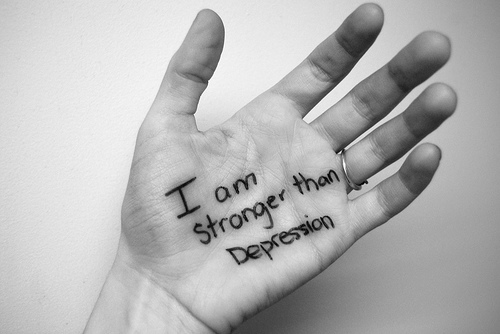 Having mental illness does not make you’re weak, it means you’re strong. When you have to deal your mind being ill and working against you then everyday can be a struggle, and the fact that you are able to get through those days despite living life on ‘hard’ mode is proof of that strength. Any accomplishment you achieve will mean that much more because everything has been working in favour of you not accomplishing it, but you did it anyway. And those things can be anything from larger accomplishments like completing a degree or going traveling, to simply getting through everyday tasks such as getting out of bed and brushing your teeth, because even those can be a struggle when dealing with an mental health issue. I'm 23 and am only now coming to the end of my second year of uni. If everything had ran smoothly in my life I should have been in this position three years ago. And one of the main reasons for me being behind is because of having serious bouts of mental illness in my past. But I know that when I finally do graduate it’s going to mean that bit more to me than for those who were able to complete their schooling without major setbacks. And the fact that I’m even still trying, rather than giving up at the first hurdle, makes me proud. I've had friends who have been really upset and embarrassed about falling behind at university because of mental illness. But the fact that they keep getting up and trying again whilst their own minds keep pushing them down is admirable and proof in itself that having to deal with mental illness means being strong. Even if you find yourself in a situation where you do have to give up on something, you are still not weak. Firstly, I wouldn't call it 'giving up', but instead allowing yourself the chance to recover, and not taking on something that you’re currently not well enough to do. If someone broke their leg before taking part in a marathon they had been planning on participating in would you call them weak for then deciding not to run it because of their injury? No, you wouldn't, because them pulling out would be completely understandable, as running a marathon in their condition just isn't realistic or healthy. And this goes form mental illness too. The best thing to do in a situation where you are not able to continue with something because of your mental health is to try to recover by giving yourself a break from it and getting the best help you can (for example seeing a doctor or therapist). This can then give you the chance to run that metaphoric marathon in the future when you are able. If you find yourself wondering why your peers haven’t ‘given up' whilst you have then remind yourself that they’re not dealing with what you are. Even if they do happen to have a mental illness then remember that everyone’s illnesses vary in severity and manifest themselves differently. Also people often struggle more than anyone can realise by only looking in from the outside. So if you're reading this and have or have had a mental illness then try and remember not to ever be too hard on yourself. Mental illness is one of the hardest things anyone will go through, and guess what, you've gotten through it this far, and that itself is an accomplishment.